Lymphedema is an abnormal accumulation of protein-rich fluid in the tissues that causes swelling in the arms, legs and/or trunk. It most commonly occurs after surgery, radiation therapy or chemotherapy, or because of infection, obesity, inadequate blood flow in the veins, trauma, or recovery from joint replacement and other surgeries. Symptoms include swelling and discomfort in the limbs, heaviness and limitation of movement, repeated infections, hardening or thickening of the skin. Skin changes, such as wounds or excess skin growth. There are three stages of this condition, which will be further explained in your evaluation. 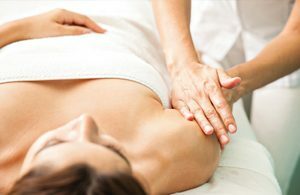 In the beginning stages, if symptoms are treated right away, swelling can be reduced in days to weeks with no recurrence; however, in more progressed stages, the symptoms are irreversible but can still be improved and maintained with the appropriate home program prescribed by your lymphedema therapist. Every patient’s symptoms and response to treatment are different, and treatment varies by individual. Generally, you should expect to be treated two to three days a week for two to eight weeks. Our staff will work with you, your family and your physician to develop a customized, comprehensive plan of care. Our trained, certified lymphedema specialists use a noninvasive program known as Complete Decongestive Therapy (CDT) to treat lymphedema. Decrease swelling and avoid re-accumulation of fluid. Utilize remaining lymph vessels and other lymphatic pathways to reduce swelling. Maintain normal or near-normal size of limbs. Increase range of motion and improve mobility. Manual Lymphatic Drainage (MLD) — MLD is a gentle, hands-on massage to move lymph fluid from the swollen region into functioning parts of the lymphatic system. This treatment can improve absorption of excess fluid by 30 percent. Therapeutic Exercise — Supervised exercise programs are designed to improve the circulation and function of the lymph system. Skin and Nail Care — People with lymphedema are at high risk for infection and require instruction in diligent care of the skin and nails. Compression Bandaging — The treated area is wrapped with layers of compression bandages to help prevent re-accumulation of lymphatic fluid. This can reduce fluid by 62 percent. Compression Garment Fitting — After swelling is reduced, you will be fitted for a medical compression garment, such as an arm sleeve or thigh high. These garments help to maintain the results achieved from treatment. Because compression is such a key component of treatment and reaching your goals, it is essential that you purchase the appropriate materials and continuously clean and bring them to your appointments. Education in Self-Management — Our lymphedema specialists will teach you how to maintain your treatment progress through at-home techniques, including self-bandaging, self-massage, exercise, and skin and nail care. Aquatics — Aquatics offers compression levels similar to those achieved with banding and special garments, with the added benefit of increasing the working pressure on the lymphatics system. Aquatics also allows patients to exercise in an environment of decreased weight-bearing, which also can assist with pain.